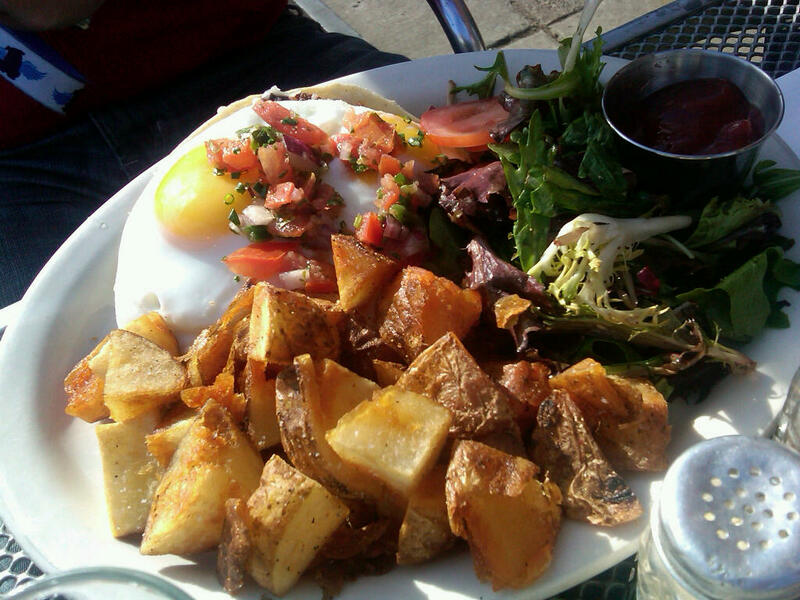 Sidecar has an interesting and diverse brunch menu–I was torn between crab benedict, the oyster po’boy and a breakfast burrito. They even had some great looking salads. But who wants salad for brunch? 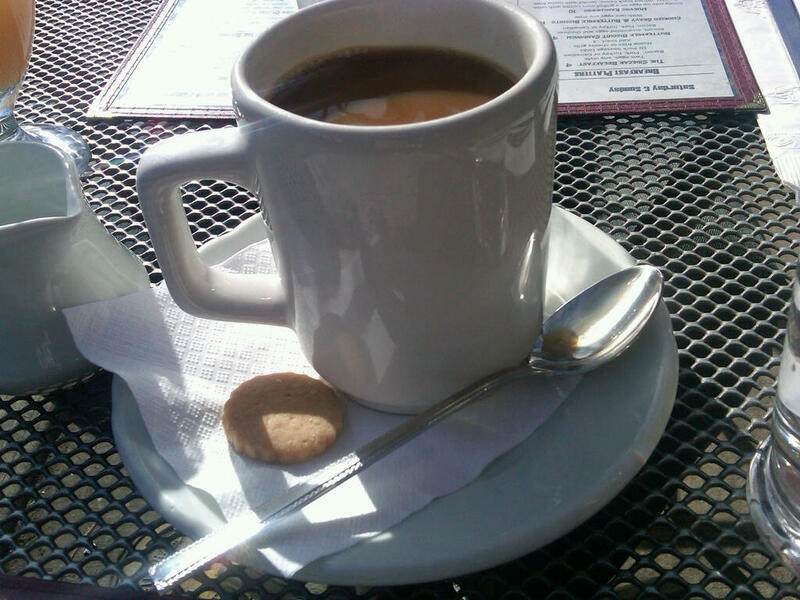 I got my coffee pretty quickly and it came with a small, quarter-sized sugar cookie. Perfect for dipping! We ended up settling on the breakfast burrito wrap for me and the huevos rancheros for him (with a side of turkey bacon for me/the dog.) Because of the opening rush, our food took a little while to come out. The waitstaff was friendly and accommodating, pouring water for our dog, encouraging my husband to add chorizo to his dish and telling me to “take it AND like it” when I said that I’d take some more coffee. I love it when they keep things interesting. Luckily we got there at the right time, though, because there was a quick flood of people and a wait for outdoor tables. I guess everyone was thinking like us. I really enjoyed my wrap. 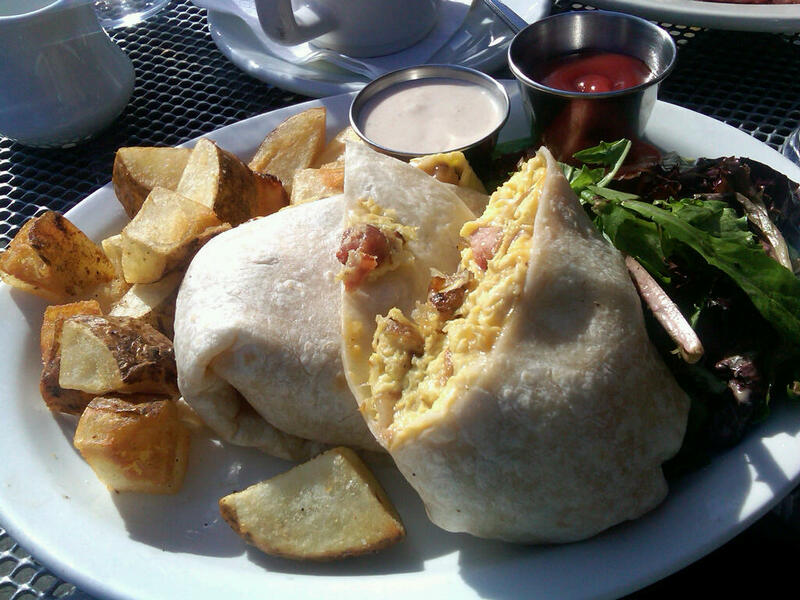 It wasn’t your traditional, overstuffed breakfast burrito just pouring with eggy-ness. I’m not the biggest fan of eggs–to me they’re more of a carrier food like tofu. The burrito had a nice balance of eggs, potato and cheese with a nice smoky mayo on the side. My potatoes were nicely crisped, although they could have used a bit more salt and I like a lot of crisp. The salad was a nice touch–made me feel as if I was eating healthy after that heavy meal. It had a light, tangy vinaigrette and that was poured with a light hand. There’s nothing as unappetizing as an overly dressed salad. My husband enjoyed his version of huevos rancheros with chorizo. Again, it was a lighter take of the traditional dish. I didn’t taste it, but he certainly enjoyed it and the chorizo turned out to be a great addition. Look at his potatoes though–they are CRISPIER THAN MINE! In a prime example of personal taste, he asked me “why did I get all the crispy bit?” I responded my scooping them onto my plate with a quickness.